Providing comfortable, warm and cosy accommodation with a home from home feel, Chalet Blanchot is a great choice for groups, who like to truly unwind after their challenging day on the slopes. With a beautiful open plan lounge, complete with log burning fire, the temptation to curl up and relax at the end of the day is hard not to give into. The lounge is spacious and sociable and seating is comfortable so you can sit together and chat about the day’s events while feeling really at home. A door from the dining room area opens out onto a South and West facing balcony and allows you to take in the absolutely amazing views out into the valley and across the mountains. This accommodation has four bedrooms, all with en-suite facilities, so is ideal for groups of skiers or families. Located in Plan Peisey, in the Les Arcs resort, Chalet Blanchot is very convenient to most facilities. The village centre is just 150 metres away which although purpose-built for the ultimate in convenience, has the authentic charm of a traditional alpine ski town. The ski lift is only one minute walk away and the Vanoise Express, linking La Plagne to Les Arcs, is a 400 metre walk from the chalet. Sport lovers can enjoy a wealth of fantastic pistes, some of which take you high up to the glacier and others which bring you right down through the trees- there is something for everyone. Rooms 1 and 2 can take a cot but it will be tight. The Chalet Blanchot chalet host lives out. Rooms 1 & 2 can take a cot but will be tight. As a party of 8 adults we had a fantastic week in february staying at Chalet Blanchot. Resort: We were extremely lucky in the fact that the snow drought halted just prior to our arrival (!) but even without this stroke of luck would definitely recommend the chalet and resort. The chalet is one of a 'nest' of chalets located at the bottom of a blue run at the far end of the resort. We were able to ski home every day, remove skis / boards and walk the approx 5 metres to our chalet. Perfect! 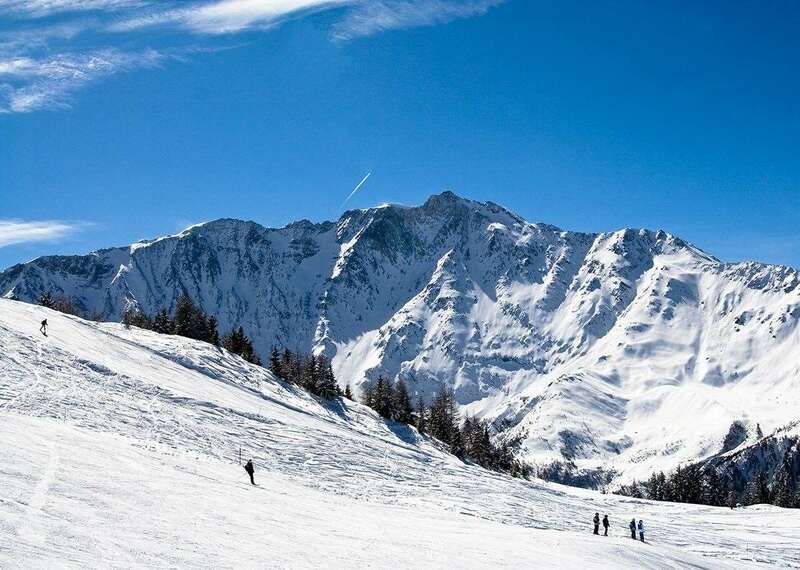 Access to the higher slopes is via a chair lift (approx 50 metres away) from which you can ski across to the Vallandry main chair and then up to higher les arcs slopes and resorts. This is not a resort for party animals. There are a few pubs / bars the loudest and most popular of which seems to be the'Mont Blanc' which is a 10-15 minute walk away and located in Vallandry slopeside. This is a quieter and extremely family friendly resort with some nice restaurants. We had a great meal at the 'Vache' which is situated at the bottom of the blue run home. A nice spot for an apres vin chaud and also serves good reasonably priced food (great traditional / savoyarde). The ski area is vast. As well as Les Arcs, you can also access La Plagne via the Vannoise Express cable car which is located in Vallandry. We opted for the entire Paradiski pass (gives access to Les Arcs and La Plagne) although to be honest found the runs more enjoyable in Les Arcs. The snow was better in Les Arcs on this particular occasion which also influenced our decision considerably! Chalet: The location of the Chalet was perfect. A very short walk to the chair in the morning kept the skiers happy and being able to ski home kept everyone happy. The chalet was clean, comfortable and roomy enough for 8 adults to not be treading on each others toes. A nice balcony meant we could enjoy the view in the sunshine, but there are no other 'frills' with the chalet. No steam room / sauna / jacuzzi. This wasn't a priority for us at all, but for some I guess it may be. The rooms were clean, comfy beds and all en-suite with great pounding hot showers. There is a small tv/dvd player and a music system and a comfortable lounge area. Our chalet hosts were fantastic! Nick and Helen were polite, friendly and great cooks! Nothing was too much trouble for either of them and we all agreed they had looked after us fantastically well. To sum up - a great resort and a great chalet. The acid test I guess is would we stay there again? A resounding yes.